"Break a Tax Law...Get a Bonus from Your Boss (the IRS)?!" In case you haven’t heard, the Treasury Inspector General for Tax Administration (TIGTA) recently issued a report finding that IRS employees who owed back taxes were paid lucrative bonuses. According to TIGTA, more than $1 million was paid to over 1,100 IRS employees who are delinquent on their taxes. "Get Your Piece of a $760 Million Pie"
If you have unfiled tax returns do not hang your head in shame! You are not alone. 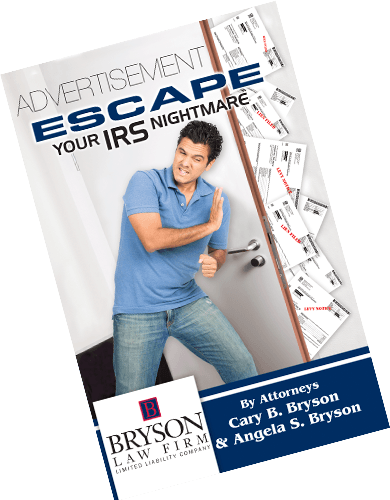 Cary and Angie Bryson of Bryson Law Firm, L.L.C. were asked by New Orleans attorney, Doug Sunseri, to be guest co-hosts of his WWL radio show "All Things Legal" last Sunday morning. The show plays each Sunday morning from 8:00 to 10:00 a.m.
"Obama Will Seek Broad Expansion of Overtime Pay"
WASHINGTON — President Obama this week will seek to force American businesses to pay more overtime to millions of workers, the latest move by his administration to confront corporations that have had soaring profits even as wages have stagnated. "Hoyt Cattle Scam Victims: There are Options!" Do you want your piece of the great outdoors? How does cattle farming sound to you? And, what if the investment could also guarantee you enough income to retire? Does this sound too good to be true? Well, it is!!! Just ask the HOYT CATTLE PARTNERSHIP INVESTORS WHO RECEIVED GIANT TAX BILLS FROM THE IRS FOR INVESTMENTS THEY MADE 30 YEARS AGO!!! "Louisana State Tax Amnesty 2014"
You may remember hearing about the "LA Tax Amnesty 2013: A Fresh Start." The Louisiana Department of Revenue (LDR) offered this program in 2013 to give Louisiana residents an opportunity to bring their past due tax liabilities up-to-date by paying all taxes due, with waiver of all penalties and 50% of the interest. The 2013 program received more than over 52,000 applications with payments totaling over $435 million. Did You Know That Social Security Benefits are Taxable? Can I Really Pay the IRS Pennies on the Dollar? People ask me all of the time – "Is it really possible to settle with the IRS for pennies on the dollar and have the rest of my tax bill forgiven?" Here's my best answer – "Yes, it is possible . . . but it's not easy and the odds are not in your favor." We are grateful this morning for our Bryson Team. For the past several weeks we have been getting calls and letters from our clients thanking us for the work we do for them. I have to say as a practicing attorney for over 20 years this is the MOST rewarding part about what we do here.